Available in a wide range of designs to suit detection coverage for exits of any width, store aesthetics and regulatory requirements. Our pedestal systems feature the high performance levels you expect from Tyco. Preserving store aesthetics and maximizing customer flow, the Sensormatic AMS-1140 is the right detection system for the value conscious retailer in any retail setting. Acrylic maintains a straight edge form, providing a transparent look when viewed from any angle. Does not require side supports as found in many other pedestal systems. Shoplifting remains to be the number one source of retail shrink worldwide. Retailers continue to search for solutions to help them reduce shoplifting and shrink, while protecting their bottom line. The Sensormatic Ultra•Post 6 delivers up to1.8m (6ft) detection coverage between pedestals, to help protect critical assets --- employees, shoppers and merchandise -- while reducing shrink, and theft. The Ultra•Exit 2.4m system offers the highest level of theft deterrence, while preserving store aesthetics and maximizing customer flow. 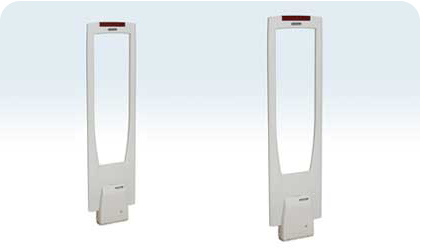 The Sensormatic Digital Door-Max system delivers world-renown Ultra•Max® anti-shoplifting protection to your door. The attractive, slender antennas cover exits up to 6.2 ft. (1.9 m) wide. You get superb detection performance, easy operation, and peace of mind for your inventory investment.